Provided for birth defects, blood disorders, diabetes, dyslexia, genetic disorders, hangover, insulin resistance pregnancy complications and much more. By Craig W. Wyatt Jr. This universal collection of poetry invites you into the world of an inspirational poet as he shares his unique perspective on life that will leave you feeling fulfilled. Al Musella's wonderful website for brain tumor research and clinical trials. A great forum for young adult survivors of glioblastoma multiforme brain tumors. The International Brain Tumour Alliance (IBTA) was established during the conference of the World Federation of Neuro Oncology held at Edinburgh (UK) in May 2005. It seeks to be an alliance of the support, advocacy and information groups for brain tumor patients and caregivers in different countries and also includes researchers, scientists, clinicians and allied health professionals who work in the area of brain tumors. Children's Hospital Los Angeles continues to work on finding less toxic treatments for children diagnosed with cancer. We are pleased to support their amazing efforts. This information is for educational purposes only. We cannot assume responsibility for its accuracy. Please, obtain information about your condition from your Doctor. 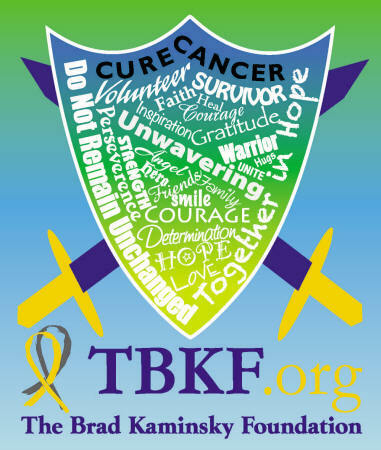 The Brad Kaminsky Foundation does not endorse any service, treatment, institution or physician.